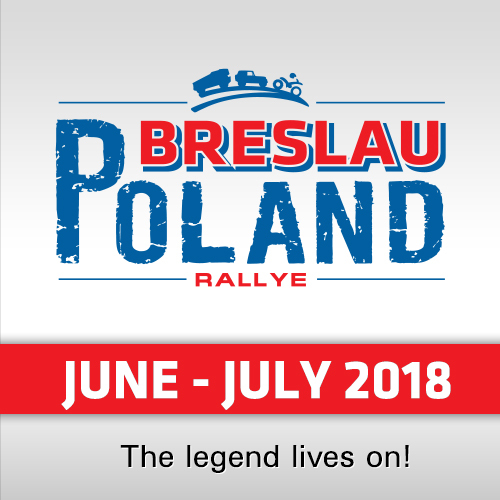 The 2018 Dakar Rally is incredibly exciting, especially in the trucks. 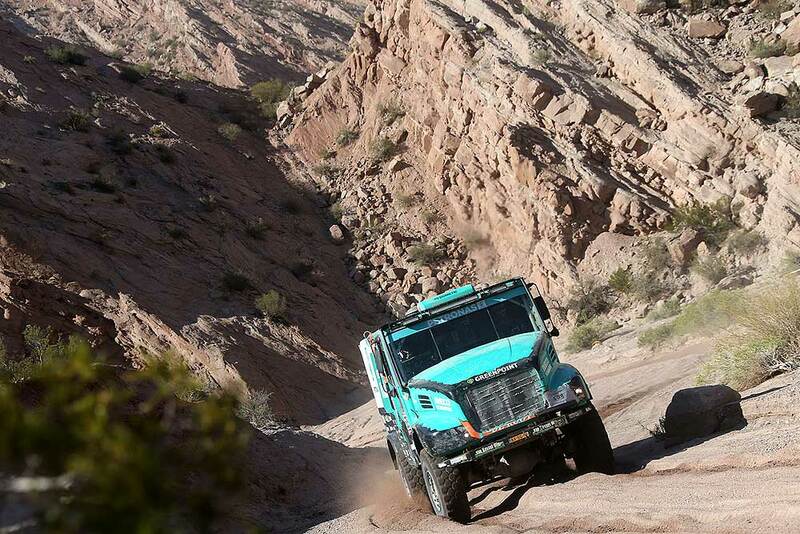 After just one day, De Rooy Iveco´s Federico Villagra lost the lead in the classification again to Kamaz´ Eduard Nikolaev, but after 3.425 kilometers of racing the difference is only one single second. 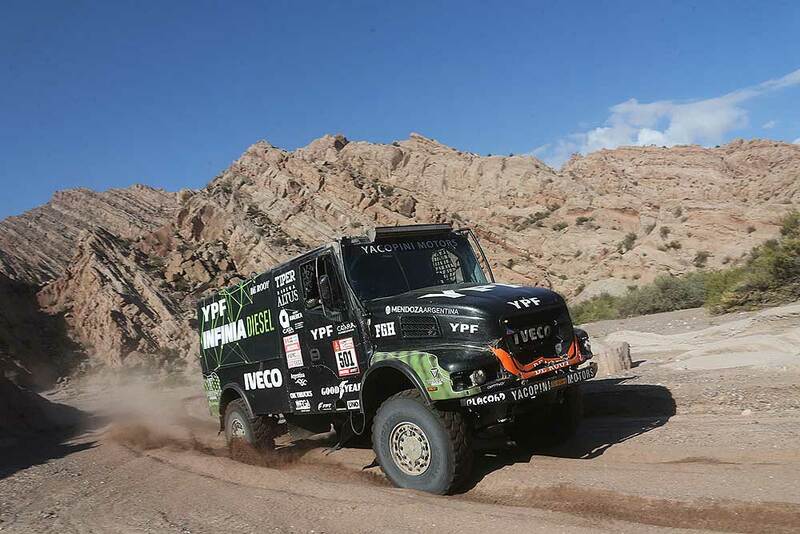 In SS12 of the rally De Rooy Iveco team-mate Ton van Genugten grabbed his third win. But he didn’t get anything for free on his way between Chilecito and San Juan. Van Genugten, who started 12th, was the sixth truck at the second checkpoint. Villagra at that point had built up a gap of 32 minutes on his rival Nikolaev, who was in trouble. 400 kilometers further though, that lead was evaporated, because Villagra also ran into problems. "An air hose broke and that caused a number of cables to burn," says the Argentinian in the bivouac in San Juan. "Then we also got a puncture." 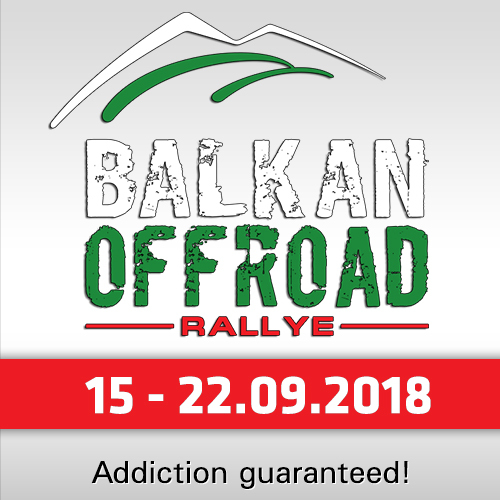 In the neutralization (a connection of 90 kilometers between the two parts of the stage), the mechanics could make some repairs in the very limited time, but in the second part something went wrong again. "The last 35 kilometers I could only drive at a maximum of 50 km/h," says Villagra. "I lost all of my advantage. 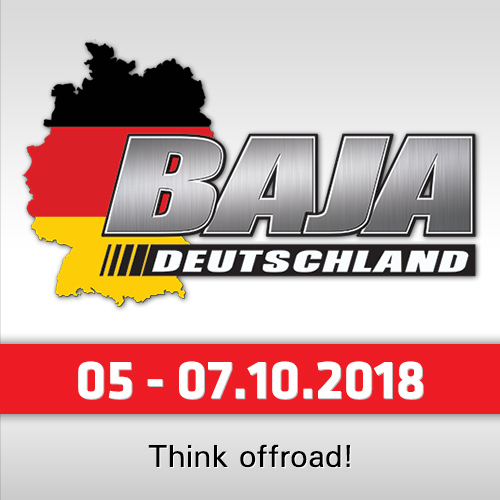 With one second difference and two days to go, the Dakar actually starts over again. Everything is open. You can see how much can change in a day: From half an hour plus to one second behind. Unbelievable." The penultimate and final stage are in the surroundings of Córdoba, Villagra’s home ground. That could be in favor of the Iveco driver. "I know it’s two more heavy stages, but we’re going to do everything to get that victory." In any case, Villagra can count on the support of Ton van Genugten, who recorded his third stage win and is ranked 5th again in the standings. "The top 3 is only possible when something very crazy happens," Van Genugten concluded realistically. "But helping Villagra to victory, that should be possible." Now that the top 3 is almost certain out of reach, the three victories are a plaster on the wound. This third one came about with blood, sweat and tears, because Van Genugten had some bad luck too. In the first part of the special, he had to stop because the closure of the bonnet had come loose in a deep water crossing and the hood was blowing open. "Since I already lost a bonnet yesterday, it did not seem very convenient to write another one off." Van Genugten was in second place at the start of neutralization. He had lost a bit of time because he stopped at Villagra to help change the flat tire. With the information that Van Genugten had when he entered the second part, he knew, however, that winning was not impossible and he gave it his best. "The second part was typical Kamaz terrain: They plough through everything. But with the Powerstar I could keep up the speed much more easy, where I used to lose it with the Trakker." At 60 kilometers to the finish, Van Genugten asked his mechanic Bernard der Kinderen to increase the pressure in the tires a bit, so that he could make some more speed. "But I had not yet said it or got a puncture. That was a shame. It gave the remainder of the stage a lot of extra tension because we no longer had a reference. We were calculating and counting back to find out what our position was." Van Genugten pushed the pedal down, despite the fact that the last part was very tough. In a sharp turn to the right he hit a bush which caused another puncture. Navigator Peter Willemsen immediately shouted that it was only one kilometer left to the finish. "So I continued. The rim was still in one piece, so that was possible. If necessary, I would have crossed the finish line on three wheels." The fact that this third victory was a hard-won, with constant changes at the lead and every competitor ran into some kind of problems, made it extra nice. "That’s the Dakar, right? You are never almost there. The next two days still a lot is going to happen."